*Dr. Caccamise has very generously shared his images of patients taken while operating during the "eye season" in rural India as well as those from his private practice during the 1960's and 1970's. Many of his images are significant for their historical perspective and for techniques and conditions seen in settings in undeveloped areas. 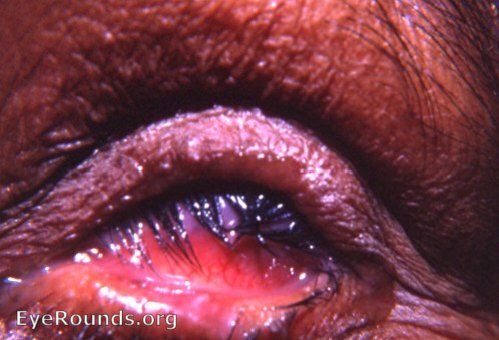 Trachoma is a chronic inflammatory disease of the eye and the leading cause of blindness. 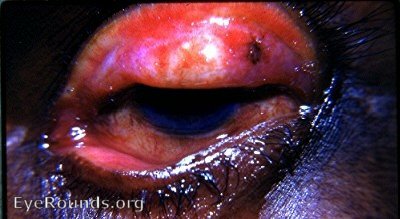 Trachoma is due to Chlamydia trachomata infection. Trachoma affects millions of people worldwide, primarily in rural communities of the developing world and in the arid areas of tropical and subtropical zones. 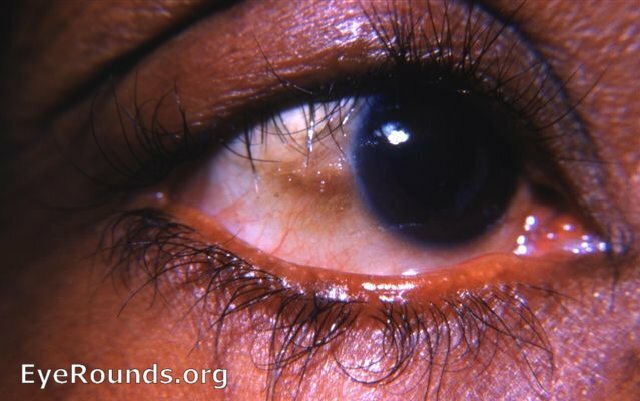 Macallan's classification of trachoma is based on the sequence of the developmental changes of the disease and on the prominence of three features: follicles, papillary hypertrophy. It was in use at the time of these photographs. The WHO simplified grading system came into use in 1987. Where trachoma is endemic, e.g. India and Nepal, trichiasis of any degree indicates that the patient has trachoma until proved otherwise. The follicles are the yellow conjunctival dots seen in the superior tarsus. 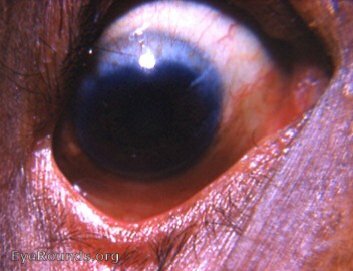 There is also 1 follicle on the bulbar conjunctiva. 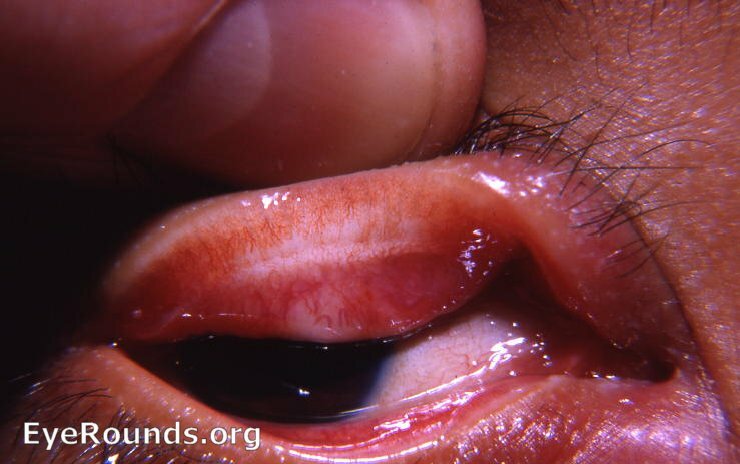 Pannus is manifested by the bloodvessls growing into the cornea superiorly. 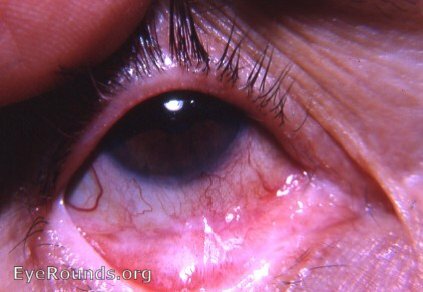 The blood vessels must invade the cornea beyond the limbal arcade superiorly to be considered pannus. 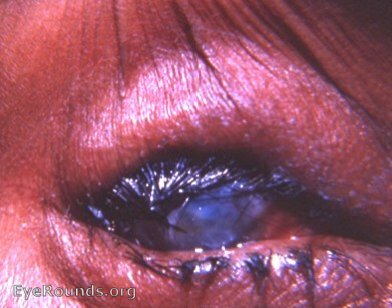 In this photo an advanced stage of trachoma is seen: marked symblepharon formation - pemphigoid-like; trichiasis; with the slit-lamb, pannus is seen superiorly. Slit-lamp examination of the patient's cornea revealed new blood vessels passing through the gray zone into the cornea superiorly. The gray area at the superior limbus is an essential zone in deciding whether vessels in that area meet the requirement for being called part of a pannus. If the vessels are seen to loop back without entering the cornea beyond the gray zone, they are part of the normal limbal arcade and not part of a pannus. 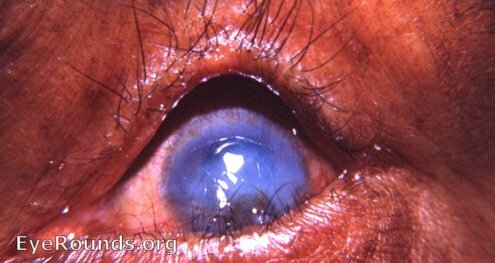 A pannus is young vascularized connective tissue (granulation tissue) growing into the cornea beyond the gray zone with its normal limbal arcade. 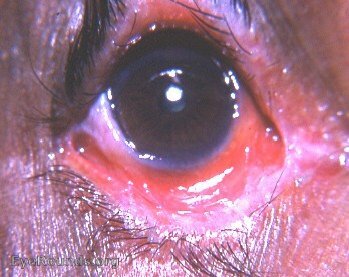 There is also an aberrant lash in the upper lid that is part of the trachoma afflicting this eye. This photo demonstrates the stigmata of established trachoma, i.e. 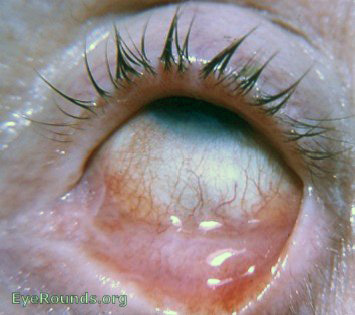 trichiasis, pannus, and corneal scarring. Pannus means cloth and crassus means thick. Pannus crassus is a form of trachomatous pannus that is thick and succulent. It consists of a thick, superficial infiltration of the cornea by young, highly vascularized connective tissue, i.e, granulation tissue. It has sometimes been referred to as pannus carnosus (pannus cloth and carnosus fleshy). 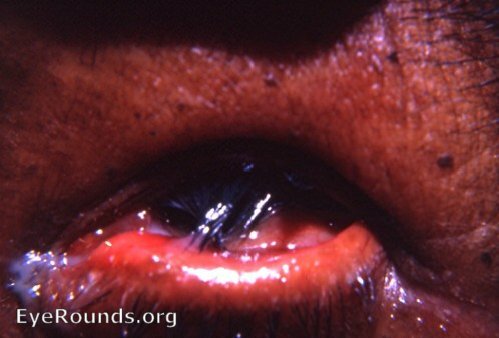 The photo offers a perfect example of this manifestation of trachoma. This is a classic example of trachomatous scarring. There is a suggestion of an incipient Arlt's line. 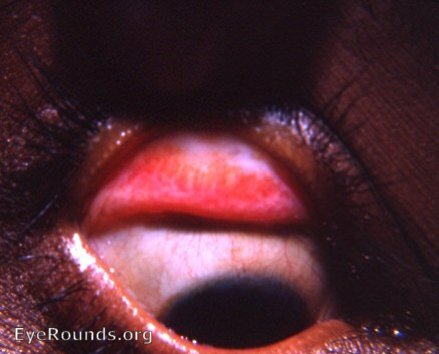 This photo demonstrates extreme lid distortion with trichiasis in trachoma. 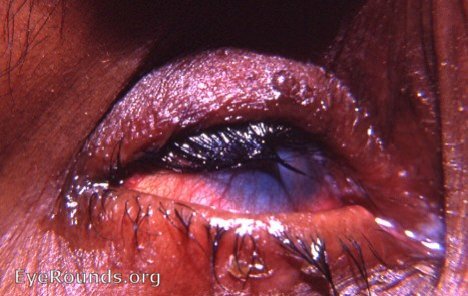 Severe corneal damage in trachoma patients is due primarily to the constant rubbing of the cornea by errant, bristle-like lashes. Advanced cases are an endless challenge for the oculoplastic surgeon. At the Kurji Holy Family Hospital Eye Clinic 1951 through 1968, operating time could be totally consumed, if desired, by surgery on patients like the female in the photo. 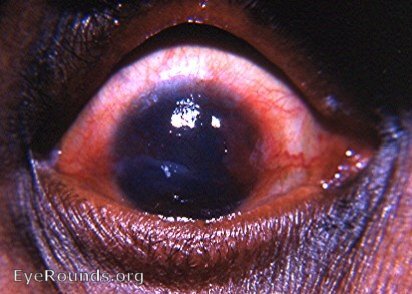 Another photo of an advanced stage of trachoma. 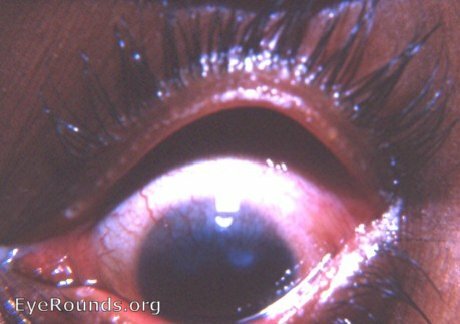 Tylosis (or pachyblepharon) is a thickening of the tarsal border of the eyelid. Thylefors B, Dawson CR, Jones BR, West SK, Taylor HR. A simple system for the assessment of trachoma and its complications. Bull World Health Org, 1987; 65: 477-483.